Thank you Kanga but this thread is about Mark Saunokonoko's podcasts. Please keep on topic . Updated DNA:- Mark has contacted the Home Office and Teressa May, acknowledged but no further progress (states again there are other avenues). He uses an American defence lawyer (David Randolph) to discuss what can happen within police investigations, noble cause corruption, conformation bias, tunnel vision or arrogance about what actually happened (they only stick to what they believe) are discussed. David Randolph also gives his view on the DNA, he's cautious due to small mixed sample which would be analysed using the algorithms and statistics he questions the reliability. He does however think it can do no harm and that the reluctance (to hand over data) may be becauase the initial results from 2007 could be proved wrong (nobody likes to be proved wrong). The 2011 interview by Rahni Sadler with the McCanns is discussed (did you kill your daughter) and the 2017 fuller interview is played where Gerry considerably expands the answer but it was edited in the 2011 version. Mark points out how easy it is for the media to 'build' a story. Mark McClish (ex US Marshall and secret service) is a statement analysis 'expert' gives his opinion on the above interview. He states possible deception from Gerry however he puts in an important caveat. Timing of the statement is important if years have gone by (like this interview) and it has been high profile or subject to public scrutiny etc. then the interviewee may feel they need to explain more i.e. to counter some of the things that have been said in the public domain etc. This needs to be taken into account (something Peter Hyatt didn't pick up on). Sonia Poulton is given another airing, she describes how after her 'trailer' about her Madeleine investigation was 'aired' she has been ostricised by the media for questioning the abduction theory. She states that typically leaving kids alone like the McCann's did is a middle class acceptable practice in the UK (utter nonsense!!!). She does however state that everything in the official narrative is questionable but you're not allowed to question it! Paulo Reis discusses the media and how the Portuguese were portrayed as incompetent (and much worse) in what he described as a co-ordinated attack. Alex Woolfall & Bell Pottenger are given a mention along with the £500K to keep Maddie on the front page for a year. Jeremy Paxman interview with Gerry is to ask about the McCann's courting media attention. Clarence Mitchell was approached about Mark interviewing the McCanns which was refused, Mitchell also refused to be interviewed himself. Sandra Felgueiras's "Ask the dogs" is given an airing. I hope to have an update on this front soon. Thanks for this. I was wondering the same thing re how it was progressing. I'm really enjoying the pod casts. For those of us who haven't kept up and maybe might be a bit detached from the case but have a renewed/revived interest in it, they're providing an excellent and really well and meticulously constructed catch-up. I'm a bit saddened by the latest podcast. What started out so well with interviews with PeterMac and Enid O'Dowd has now sunk into an 'Operation Grange is ignoring offers of breakthrough DNA' when Operation Grange does not have primacy and does not own the DNA samples or the data. I find it particularly interesting that Sonia Poulton's credentials are zhooshed up a bit when she interviewed Shrimpton, Birch and recruited Hutton to be humiliated in the Sun. The podcasts are now extending into the areas of prosecutions in USA and USA law. This crime was committed in Portugal. This crime if ever it is solved will be tried in Portugal. The next podcast includes Pat Brown, a US criminal profiler who allegedly offered her services to the McCanns, has an opinion, spoke to the Australian media, claimed she was edited/misquoted, tried to sue them in a twitter flurry and it turned out to be a storm in a teacup. Ms Brown is currently implying IPSO (UK) have no time for misquoting her and she is unable to sue. @aquila wrote: The podcasts are now extending into the areas of prosecutions in USA and USA law. I listened to this podcast earlier and thought the same - what the heck has it got to do with the USA? These people featured during the podcasts are opining on possibilities, maybes and what ifs, it amount to nothing but stuffing to pack out an otherwise endless string of 45 minute episodes with little to add that's not already known - it's just waffle akin to that of the changeable Colin Sutton and the dastardly pliant Mark Williams-Thomas. Sonia Poulton, despite her attempts to steal the limelight at every given opportunity is really all about me myself I, with little in between apart from the issue of trolling - also always about me myself I, which is ever present in her narration. Remember the contrived Rothley doorstepping incident - nah, let's not go there. Confusing to the uninitiated, to say the least. This all makes me very uneasy - I'll stick to the people I trust, those who give their time freely and work endlessly in pursuit of justice for little Madeleine McCann. Each week he utilises experts or commentators, none of which, in the main, have said anything which most would be able to take umbrage with. The DNA and Dr Perlin being of particular interest. He has mostly followed the PJ released files and questioned the McCanns story. This week Sonia Poulton featured (for the second time) and she gave a decent account (apart from the leaving kids alone part). David Rudolf (I got his name wrong earlier) is a defence lawyer who Mark had previously interviewed on another case and he obviously thought the guy had something worthwhile to say. David discussed investigators various bias, what wasn't clear was that he was talking about the Portuguese or UK. His view on the DNA was saught and he was a bit sceptical, given he's a lawyer not a scientist it's easy to see why he'd think that way. Paulo Reis featured about the media and that was the main theme of this podcast, how it can be manipulated and the treatment of the Portuguese from the UK press. I don't think anyone here would say Paulo didn't add value to the section. I can't see what difference it makes what country the experts /commentators come from, they are either value adding or not. Mark McClish was another example of an expert from the US, the subject matter and his expertise is what's required not his knowledge of Portuguese law. Pat Brown is 'next up' let's see what she has to say without pre-judging. It's been a very good set of podcasts so far, how many people will honestly be able to say they've heard it all before or learned nothing? Mark is well aware that this is a Portuguese led investigation, he has stated that an update on that front will be coming soon. IMO it seems contradictory to be in favour of contacting Operation Grange about its activities (or lack of same) via numerous freedom of information requests, yet critical Of Mark Saunokonoko when he contacts them. If Grange is just a red herring, a sideshow or a second fiddle to Portugal (since the latter has primacy in this case) why on earth have numerous requests, to the self-same Op. Grange, for freedom of information responses been applauded as positive moves! Either Op. Grange is to be totally ignored as an irrelevancy or it isn't. One can have it both ways! Clarence Mitchell took the roadshow over to Australia. Gerry and Kate McCann took the roadshow over to America. 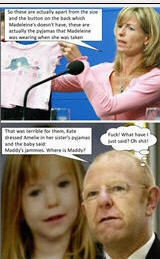 Madeleine McCann disappeared when holidaying in Portugal. Portugal retain primacy. Gerry and Kate McCann are from the UK. @Phoebe wrote: IMO it seems contradictory to be in favour of contacting Operation Grange about its activities (or lack of same) via numerous freedom of information requests, yet critical Of Mark Saunokonoko when he contacts them. If Grange is just a red herring, a sideshow or a second fiddle to Portugal (since the latter has primacy in this case) why on earth have numerous requests, to the self-same Op. Grange, for freedom of information responses been applauded as positive moves! Either Op. Grange is to be totally ignored as an irrelevancy or it isn't. One can have it both ways! Mark Saunokonoko's claimed attempted contact with the Metropolitan Police was not a FOI request. It was relative to the offer of the services of a third party from the US of A. The UK authorities are obliged to respond to legitimate FOIs. They are not obliged to respond to a cold call from a Portuguese journalist or an American commercial enterprise offering promotional innovative forensic analysis. @ Verdi. I think you miss my point. If Grange is merely a sideline show, since Portugal has primacy, why is anyone bothering to ask any information of it via FOI requests, and why are we applauding such requests. In any case, Grange has asked for anyone with information which might assist their investigation to come forward with it. Saunokonoko made it clear that this was the approach he took re the DNA evidence. @Phoebe wrote: @ Verdi. I think you miss my point. If Grange is merely a sideline show, since Portugal has primacy, why is anyone bothering to ask any information of it via FOI requests, and why are we applauding such requests. To prove the point that Operation Grange is a bogus unit created to protect the McCanns and their group of friends? I think you miss the point full stop. Not sure why Forensic Scientist Angela Gallop thread is being brought up it has nothing to do with the Mark Saunokonoko podcasts. As for Mark's FOI requests he specifically said that he contacted the Home Office who passed him to the National DNA Database, from there he was passed onto the Forensic Archive who stated the data had been withdrawn for review in 2012 (FSS closed in 2012). He finally contacted Leicestershire Police and was refused. Forensic Archive Ltd. (FAL) was previously named Forensic Science Service Ltd. (FSS), which was the leading supplier of forensic science expertise to law enforcement agencies in the UK. On 14 December 2010, the Government announced that it had decided to wind down Forensic Science Service Ltd.’s forensic operations. As a result of this decision and following the complete closure of FSS’ forensic operations, FAL’s services to the criminal justice system are now limited to the secure retention and management of forensic casefiles and case material. The new name took effect from 01 October 2012 to reflect this new emphasis and functionality. For the purposes of the Freedom of Information Act 2000 (FOI Act), FAL is a Government Owned Company, and therefore meets the description of a public authority. As such, FAL is under an obligation to comply with the FOI Act’s legislative provisions concerning access to recorded information. So, as we well know getting information from government departments etc. is a time consuming lengthy process and he ended up no further forward (from the FOI requests) although we learn the data was withdrawn in 2012. Why is he pursuing Operation Grange for the data? FSS were based in the UK and were a government run organisation, every scrap of data they have on the highlighted DNA samples may not have been handed over to PJ. The Forensic Archive (as described above) should have retained the master records (as the master records of any testing actually belonged to FSS and thus will be stored / will come under their retention processes). It's not entirely clear whether the PJ ever received the digital numerical data from the samples there's been no definitive answer (Mark has tweeted on more than one occasion that the contact with the Portuguese is in process and will update soon) whereas Mark is confident that the UK will have had the required data because the tests were conducted there. Mark has for some reason been given a 'rough ride' by some on CMOMM which I don't particularly understand, he is seeking to get a more truthful version of what's happened out to a wider audience, what's wrong with that?. We here claim to only have the interests of truth and justice for Madeleine but it would appear that this truth and justice has to be the CMOMM version (and even then it's not a unanimous view). 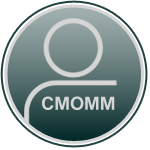 In some cases the only recognition Mark has received has been when CMOMM members (PeterMac, Enid O'Dowd & Paulo Reis) have featured in the podcasts (HiDeHo has input as well as far as I know), now why would that be? Are others who are not members here not worthy of an opinion or being listened to? Mark has uncovered what could be the jewel in the crown with the offer of modern DNA analysis (we may never get to find out), something that has not been discovered / proposed by any other forum / social media / armchair detective / call it whatever you like. Give him his fair dues and let's see if it takes us anywhere. Surely Mark's publicity re his contacts with Grange, Home Office and Teresa May is doing the same. He has made public his contact with them to draw their attention to the offer of a new method of testing the only forensic evidence in this case and their responses. Why it can be hard for police to admit they have been wrong. A phenomenon called noble cause corruption can sometimes unintentionally bias police investigations and lead to miscarriages of justice according to a high-profile American defence lawyer. Veteran attorney David S Rudolf became something of a digital age folk hero after appearing in Netflix show The Staircase, a true crime documentary detailing the murder of US author Michael Peterson, who was found guilty of killing his wife but later had his conviction overturned. Speaking in episode eight of Maddie, Nine.com.au's podcast investigation into Madeleine McCann's disappearance, Rudolf explained why, generally, it can sometimes be hard for police to back away from a line of enquiry that later appears to be flawed or wrong. "The larger problem is not the kind of corruption that we normally think about but what is called noble cause corruption," Rudolf said. And that's the kind of corruption that occurs when the police believe in a particular theory, and take steps that are extra-judicial in order to prove their theory". Rudolf explained that police, like judges, like all human beings, can suffer from confirmation bias - a psychological dynamic where people tend to ignore or emphasise relevant facts depending on their beliefs. "We all to a greater or lesser extent suffer from tunnel vision" he said. Police officers and even judges [can have] a certain arrogance about their ability to determine what actually happened, and then fall guilty to tunnel vision and confirmation bias". 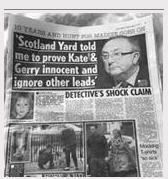 In 2017, a senior London Metropolitan Police figure rejected claims Operation Grange detectives had a 'closed mind' about scenarios which do not involve Madeleine McCann being abducted in 2007. Rudolf also offered his opinion on why Scotland Yard's Operation Grange, the $20 million, seven year UK police investigation into the Madeleine mystery, have so far failed to take up an offer from one of the worlds leading DNA scientists to solve a series of possibly case-changing DNA samples. Following an investigation by Nine.com.au, US forensic scientist Dr Mark Perlin has made a formal offer to London Metropolitan Police to untangle 18 complex DNA samples at no cost. Those DNA samples, taken from the McCann holiday apartment and rental car, were ruled 'inconclusive' in 2007 and are potentially loaded with vital clues about Madeleine's disappearance. A former Scotland Yard homicide detective, Colin Sutton, has said solving those DNA samples could be a 'game-changer' for police. Two of the 18 samples being sought for analysis by Dr Perlin were lifted from a rental car hired weeks after Madeleine vanished. 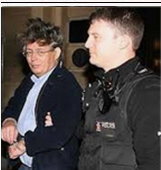 To date Dr Perlin has had no response or acknowledgement from Scotland Yard. "The natural conclusion I think is what's the harm of doing the analysis? And if you don't want to do the analysis then perhaps what you're afraid of is that you'll be shown to have been wrong in your initial theory," Rudolf said, speaking about Operation Grange's apparent unwillingness to take up Dr Perlin's offer. "And that's hard for people, you know. It's hard for people to admit they are wrong and it's hard for people to agree to testing that may show they are wrong. What it says to me is that whoever is resisting it is human and they're somewhat concerned that what they initially thought may not be the case". Operation Grange detectives were first made aware of Dr Perlin's offer in March last year. 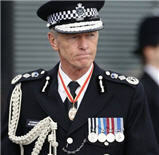 Scotland Yard have been contacted several times since by Nine.com.aubut refused to comment on Dr Perlin. 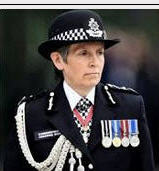 Dr Perlin, chief scientist at Cybergenetics, has confirmed to Nine.au.com he has not been contacted by anyone at Scotland Yard, including DCI Nicola Wall who heads up the investigation which was launched in 2011 and has cost taxpayers more than $20 million. In an earlier episode of Maddie, retired London Metropolitan Police detective Colin Sutton was asked what it could mean if Dr Perlin's analysis confirmed the presence of Madeleine's DNA in that rental car, a silver Renault Scenic. "On that basis, that that car was hired by the McCanns three weeks after Madeleine disappeared, then it's a real game-changer, isn't it? Because there is no way, according to the information that we have, that she could have been in that car" said Sutton, who solved more than 30 murders, including catching English serial killer Levi Bellfield. "The big question then is how can her DNA get into that car three weeks after she disappeared". Dr Perlin said DNA transference could be a possible explanation if Madeleine's DNA is found to be present in the car, and would possibly be something examined by police and forensic experts. DNA analysis by Dr Perlin could also conclusively rule out Madeleine as ever having been in the car, helping to narrow the focus of the investigation, as well as shed some light on some of the questions around the other DNA samples. "The involvement of the parents, that was dealt with at the time by the original investigation by the Portuguese" Rowley replied. "We had a look at all the material and we are happy that was all dealt with and there is no reason whatsoever to reopen that or start rumours that was a line of investigation"
During questioning, he fended off criticism of Operation Grange and it's investigative remit of a potential abduction appeared to have a 'closed mind' to the possibility of the involvement of someone known to the family, an accident or the girl walking out of the apartment. Mr and Mrs McCann left madeleine and their two other children alone while they ate dinner at a nearby restaurant with a group of friends. They believed an intruder struck while they were out, taking Madeleine from her bed. Still you evade the point Phoebe - no matter. I tire of this endless game of ping-pong. @Skylight wrote: For those of us who haven't kept up and maybe might be a bit detached from the case but have a renewed/revived interest in it, they're providing an excellent and really well and meticulously constructed catch-up. If people haven't kept up or might be a bit detached from the case, how can it be said in the same breath that these podcasts provide 'an excellent and really well and meticulously constructed catch-up' ? If you are a bit rusty how can you make such a bold declaration? This is the point some have been trying to get across. It's all very well promoting the podcasts as a public awareness exercise but if the content is a bit shaky it blows the intended purpose of the podcasts apart. Presenting recorded interviews with people who have never worked on the case and/or taken an in-depth interest in the minutiae only adds to the confusion of an already very convoluted labyrinth of distorted information and superfluous waffle. How on earth can the opinion of an American, whatever their profession, have anything constructive to offer? Mrs Doubtfire of South Wigan politely asks ... 'how do you know that, where is the evidence to support your claim'? The audience cry out loud .... 'does it matter, just as long as the message is out there that we're being deceived'! The podcasts should be taken for their worth, not taken for what people want them to be worth. Their responses are the standard responses one would expect. The same we all get, whether FOI's or other avenues. Ongoing investigations (whatever their integrity) are not beholden to give running commentary to the public. It matters not who asks or how loudly that contact is broadcast. It's folly to somehow believe the podcast in some way has OG over a barrel - it doesnt. I commend the intent but let's keep things in the realm of reality. You are entirely entitled to your opinion, however it’s pretty clear that you think the podcasts are not worth much and seem intent on persuading others to be of the same opinion. Clearly you should take heed of David Rudolf’s psychological observation of confirmation bias because it sounds very much like the case in hand. Your statement of “presenting recorded interviews with people who have never worked on the case and / or taken an in-depth interest in the minutiae only adds to the confusion of an already convoluted labyrinth of distorted information and superfluous waffle” doesn’t cut the mustard either, you have no real idea of who knows what. I think most on the forum can recognise that you don’t value Mark’s podcasts which is unfortunate but not everyone can understand why he’s taken the route that he has and picked the commentators / experts. I’ll conclude with your statement of “how on earth can the opinion of an American , whatever their profession, have anything constructive to offer” is indeed racist and insulting to our American members and American's in general.
" I’ll conclude with your statement of “how on earth can the opinion of an American , whatever their profession, have anything constructive to offer” is indeed racist and insulting to our American members and American's in general." Take heart old bean, the banner of this forum includes a quote from one such American - Wendy Murphy. And IIRC, Peter Hyatt, whose work often features, is American too!! Well said. It's partly the point that Verdi and myself have been trying to hit home. How many times over the years are there frenzied shrieks of support across the internet for journalists who bring out documentaries of some sort which achieve little other than to create a bit of a media storm resulting in prickliness on fora - and I am directing this comment to HKP. Poulton was a classic example. Cries of how can you doubt Sonia, she's doing her best (her best being to interview Shrimpton, Birch and recruit Hutton to be slaughtered in the Sun). The same form is now shaping up with how can you doubt Mark Saukonoko (affectionately called Mark) and anyone who criticizes the podcast is being negative or has an agenda. It is playground childishness and I've seen it so many times.